Santos Rosewood , also called Bolivian Rosewood, is from the Machaerium family and grows in South America. 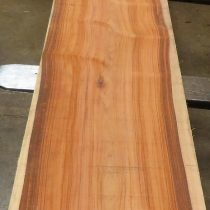 It has become a good substitute for the traditional Rosewood species. Colors range from a pinkish red to a violet brown to a deep brown. Ideal wood for fine furniture, musical instruments, architecural millwork and often used for decorative veneers. This wood has a very fine grain and sands and polishes nicely.